Hosting a summer get-together can sometimes be stressful and can often put a strain on your wallet, but it doesn’t have to, especially if you use your Ninja NJ600 blender, which features a 72-ounce, BPA-pitcher to create treats that will not only impress your guests, but be a good deal for all involved. If your summer party will be attended by little ones, consider surprising them with a tasty milk shake rather than buying ice cream with all the toppings, which can cost more than a few dollars. All you need is ice cream, which you can either make with your Ninja NJ600 or purchase at a supermarket. You will also need some milk. Add two ounces of milk to every three scoops of ice cream you use. If you are in the splurging mood, add crushed cookies or flavored syrup to the mix and top off with whipped cream. If you want to try your hand at making your own ice cream, you may want to experiment with a summer favorite — sweet corn. The New York Times recipe section has a recipe for sweet corn ice cream that you can easily make with your Ninja NJ600. Any summer party wouldn’t be complete without frozen alcoholic drinks and everyone knows the cost of alcohol can add up pretty fast. But, if you keep it simple and use your Ninja NJ600, your guests will be pleasantly surprised with your selection of alcoholic beverages. One quick and easy recipe is a classic daiquiri. All you need is rum, fresh lime juice, sugar syrup, ice and a lime wedge. Simply mix all of the ingredients, except for the lime wedge in your blender. Next, pour the drink into a chilled glass and garnish with lime wedge. For variety, you can get creative with your daiquiris by adding into the mix fruits, such as pineapples, oranges, melons, peaches, bananas or strawberries. What’s a summer party without tasty BBQ foods? You can use your Ninja NJ600 to whip up a BBQ sauce that will tingle the taste buds of all your guests without having to buy expensive bottled sauce. To make Ninja Kitchen’s Kansas City BBQ Sauce, you will need ingredients, many of which, you most likely already have in your kitchen: ketchup, apple cider vinegar, white onion, garlic, tomato sauce, brown sugar, molasses, lemon juice, paprika, black pepper, red chili powder and salt. Start by mixing the ketchup, vinegar, onion and garlic in your Ninja NJ600 on setting 1 until smooth. Next, add in the remaining ingredients and blend on 2 until your mix is smooth. For the final step, place the mixture into a saucepan and simmer for 20 minutes over low heat. You can then use the sauce right away on ribs or chicken or make ahead of time and store in your refrigerator to use on the day of your party. Thrill the taste buds of your guests by using your Ninja NJ600 to create a fruit salad with a twist. To create this Ninja Kitchen delight, you will need fresh mint leaves, superfine sugar, fresh strawberries, fresh blackberries, peaches, honeydew melon and Greek yogurt. First, cut all fruit into bite-sized chunks and place in mixing bowl. Next, put the mint leaves and sugar into your Ninja NJ600 pitcher and blend on setting 1 until finely ground. Finally, take the mint/sugar mixture and toss with fruit. Spoon into individual bowls and serve with a dollop of Greek yogurt. 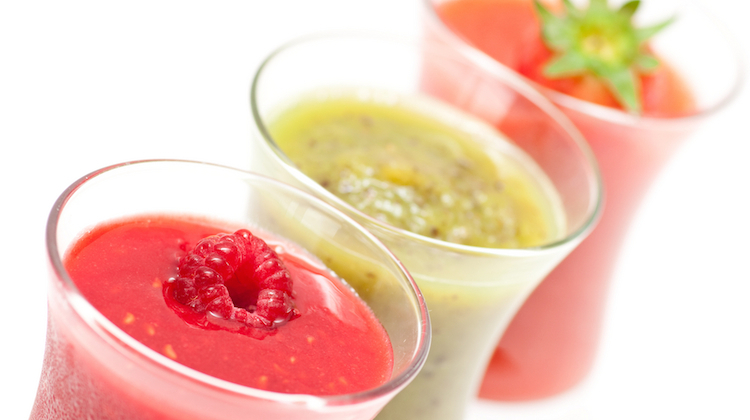 Three smoothies image courtesy of Shutterstock.